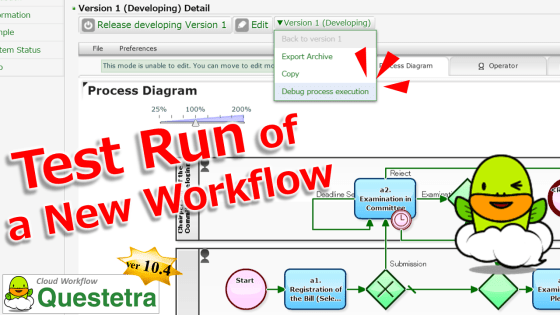 Kyoto, Japan – November 2nd, 2015 – Questetra, Inc., the global SaaS provider of Business Process Management (BPM), today announced that they have published the new version 10.4 of the cloud-based Workflow product “Questetra BPM Suite” on November 2nd, 2015. In this new version 10.4, significant speeding up has been achieved in “Combo-box form” (Search select) in the data input screen. This will allow a Select input form to set up to refer a Master data which is as large as tens of thousands of articles. For example, by registering “Customer Master” in the Workflow platform, “Selection of a Customer” in invoicing or billing operation will become more efficient and accurate. It is also possible to register entire “Postcode-address Master” which the number of records reaches 150,000. A designer of Business Process Definition (Process Model) becomes to be able to test run a Process Model (Debugging execution) in the middle of designing. From now on, you are able to flow testing Issues freely, without affecting the Process Models in operation nor Issue processing logs, whereas previously there was a need to test operation on another Workflow environment when you have modified many parts. It becomes capable of displaying by the Timezone of each User of the time information on Issue date and in the logs of Issue processing, etc. It allows overseas staffs and remote workers who are working in different Timezone from the system standard time (server time) to recognize the time information more easily. In the function of HTTP Request automatic sending to external servers, it becomes capable of sending any text as Request body. However, it is limited to the formats (Content-type) of “text/xml”, “text/plain”, “application/json”, for the time being.